Altukhov, Sergey and Nauright, John 2018. The new sporting Cold War: implications of the Russian doping allegations for international relations and sport. Sport in Society, Vol. 21, Issue. 8, p. 1120. Marung, Steffi 2018. The provocation of empirical evidence: Soviet African Studies between enthusiasm and discomfort. African Identities, Vol. 16, Issue. 2, p. 176. Kent, John 2017. The Neo-colonialism of Decolonisation: Katangan Secession and the Bringing of the Cold War to the Congo. The Journal of Imperial and Commonwealth History, Vol. 45, Issue. 1, p. 93. McIlroy, John 2017. Another look at E. P. Thompson and British Communism, 1937–1955. Labor History, Vol. 58, Issue. 4, p. 506. Romano, Angela and Romero, Federico 2014. European Socialist regimes facing globalisation and European co-operation: dilemmas and responses – introduction. European Review of History: Revue européenne d'histoire, Vol. 21, Issue. 2, p. 157. Understanding the place of the Cold War within the overall history of the twentieth century is much about understanding global processes of change. This chapter attempts to position the Cold War in the history of the twentieth century along some of its main axes: political and economic history, the history of science and technology, and intellectual and cultural history. The term 'Cold War' was first used by the British writer George Orwell to deplore the worldview, beliefs, and social structure of both the Soviet Union and the United States, and the undeclared state of war that would come to exist between them after the end of World War II. The growth of science and of technological know how throughout the twentieth century shaped much of the format for the Cold War. The Cold War was a clash of ideas and cultures as much as a military and strategic conflict. The ideologies animating the Cold War had centuries-long pedigrees, emerging by the early twentieth century as powerful and compelling visions for social change. The foreign policy of the United States drew on a long tradition of liberalism originating in the ideas of John Locke. Racial hierarchy touched all aspects of American liberalism in both its domestic and foreign-policy aspects. Soviet ideology is easier to describe and analyze than its American counterpart. Both Soviet and American leaders proclaimed the novelty of their respective views of international politics during World War I and the post-war settlement. Soviet agreements with American firms during NEP revealed both ideologies in action. The defeat of Nazi Germany in 1945 cleared the stage for the expansion of American-Soviet ideological conflict into a global cold war. Soviet authorities, after emphasizing national themes in World War II, quickly assimilated the Cold War as an ideological conflict. This chapter focuses the ideological, technological, and geopolitical pressures, which interacted to shape the economy of the Cold War. Social theorists, such as Raymond Aron and Daniel Bell, argued that both Communist and capitalist economic systems constituted varieties of a common 'industrial society'. Given the bureaucratic logic of industrial organization, liberal intellectuals explained as the Soviet regime began to "thaw" after Stalin's death, the contending systems might "converge" on a mild sort of planned economy with a developed welfare state. Underpinning this prognosis was a form of industrial structure interwar European business leaders had termed "Fordism", a concept that subsequently migrated into postwar social theory. Influence was sought in particular territories and regions, Europe at first, but then Asia and Africa. The emphasis on industrialization and economic growth, the privileged access to minerals, fossil fuels, and hydrocarbons, either by Western companies or state socialist governments, probably increased the rapid exploitation of these resources. Harry S. Truman presided over the greatest military and economic power the world had ever known. War production had lifted the United States out of the Great Depression and had inaugurated an era of unimagined prosperity. The desire for an open world trading system merged economic, ideological, and geo strategic lessons of the interwar era. Truman's anti-Communist rhetoric resonated deeply in the American polity. The overriding priority was to keep the power centers of Europe and Asia outside the Soviet orbit and linked to the United States. US officials throughout 1949 and early 1950 focused attention on resuscitating the Japanese economy. The grand strategy of the Truman administration focused on binding the industrial core areas of Western Europe and Northeast Asia to the United States. When the North Koreans attacked South Korea at the end of June 1950, Truman and Acheson immediately deployed US troops to defeat the aggression and asked the United Nations for its support. The Great Patriotic War endowed the Communist regime with broader legitimacy and brought Iosif Stalin to the peak of his popularity. The Soviet model gained new prestige, while the growth of Communist and Left parties in Europe and national liberation movements in Asia opened new avenues for expanding Soviet influence. In his speech, Stalin presented his mobilization strategy: since capitalism remained a main source of wars, the Soviet people must steel themselves for a new and strenuous effort to insure their hard-won security 'against any eventuality'. The intensification of the Cold War terminated any lingering restraints on the full-scale Sovietization of the region. The growing economic integration of Western Europe impelled the Kremlin to increase the coordination of trade and economic policies throughout Eastern Europe and to promote its dependence on the Soviet Union. The creation of NATO and a formal division of Germany solidified the split in Europe, leaving little room for further diplomatic bargaining. Wartime summit meetings had reinforced both the reality and the image of a Britain as a world power as Winston Churchill and Franklin D. Roosevelt of the United States parleyed with the Soviet leader, Joseph Stalin, while the tide of fighting brought them all towards victory. The British had wrestled, literally as well as intellectually, with both German nationalism and Communism in the first half of the twentieth century: how to live with Bolshevism had concerned Whitehall even as the First World War was coming to a close. Well before the war ended military planners were determining the elements of this reasonably clear Cold War strategy. The first priority was the extent to which British national interests could be protected and perhaps even advanced after the war. The Cold War emerged in different ways in each country and its characterisation is still essentially shaped by national political environments. In Europe, a deep ideological schism had existed since the Bolshevik Revolution in 1917. During the war, in Western eyes, Germany was much more frightening than Iosif Stalin's Soviet Union; by the same token, in Soviet eyes, Fascist Germany was perceived as a much greater danger than the capitalist democracies. The Soviet Union, whose industrial regions to the west of Moscow were destroyed by the German armies, was determined not only to bring about a massive dismantlement of German factories in the Soviet zone of occupation, but also to secure large quantities of reparations from the western zones. British policies had a considerable impact upon the division of Germany. Instead of that united Germany, two Germanies were emerging: the Federal Republic (FRG) and the German Democratic Republic (GDR). From 1949 until the collapse of Communism in the GDR, both German states were exemplary protagonists in the Cold War. Few US government programs have had so good a press as the Marshall Plan, which delivered some $12.3 billion in aid to Europe between 1948 and the end of 1951. The role of the Marshall Plan in promoting European economic integration has been questioned, and the demise of the plan in 1951, at a time when European economies were again facing economic crisis, inflation, and budget deficits, suggests a less-than-perfect performance. The economic impact of the Marshall Plan varied from country to country. If the currency reform was a sort of starting pistol for the takeoff of the German economy, Marshall aid played a crucial role in clearing a path down which the Germans could run. In France, Britain, Italy, and Germany, Marshall aid was deployed by national governments in a context framed by national politics and priorities: Washington could cajole, and sometimes insist, but the real decisions on how to deploy the aid were left to European governments. The great Soviet victories at Stalingrad and Kursk reversed the tide of the war against the Nazis and made it likely that Soviet armies would occupy vast stretches of territory in Europe. The initial period of the foundation of the people's democracies was one of the most important in the entire history of postwar Eastern Europe. After the initial formation of the people's democracies, the next stage of Sovietization involved the establishment of Communists' predominance. Economic relationships between the East European countries and Moscow were tightened, symbolized by the formation of the Council of Mutual Economic Assistance, the Comecon, in January 1949. The Soviets used a host of other means short of repression and political manipulation to impose their will on the East European parties and states. After Szklarska Poreba, the policies of the Soviet Union were to serve as the policies of the Communist Parties of all of Europe. The emergence of an ideological fault line in the Balkans provoked the first major confrontation of the Cold War. The Tito-Stalin confrontation destroyed the ideological uniformity of Stalinism. The Yugoslav-Soviet rupture also inspired Tito to seek a 'third way' and to play a crucial role in the creation of the Non-Aligned Movement. The Balkan Peninsula became a contested area among the emerging Cold War superpowers even before the Second World War officially ended. Faced with an effort by the British and Americans to consolidate their own spehere of interest in Western Europe, Stalin embarked upon creating a monolithic Soviet bloc of Balkan and East European countries through their Sovietisation. The role the Balkan states played in the early Cold War helps us fully appreciate the ways in which the dynamics of the superpower competition were critically influenced by regional political forces and distinct historical legacies. Two important international agreements influenced China's internal political situation. One was the secret Yalta agreement of February 1945 reached by the American and Soviet leaderships; the other was the Sino-Soviet Treaty of Friendship signed by the Soviet Union and the Guomindang (GMD) controlled Republic of China in August 1945. The GMD-Chinese Communist Party (CCP) relations were enmeshed with Sino-American and Sino- Soviet relations and with the conflicts between the United States and the USSR over their China policies. The outbreak of the Chinese Civil War marked the end of a distinct period of international politics concerning China. Around October 14, Chinese leaders essentially finalized their strategic plan and war objectives. They wanted to prevent the Korean War from expanding into China proper, to stop the United States from occupying the northern regions of Korea close to the Chinese border, and to help the North Korean regime survive. On August 14, 1945, still reeling from the aftershock of the atomic bombing of Hiroshima and Nagasaki, the Japanese government accepted the Allied powers' Potsdam Declaration, and World War II came to an end in the Asia-Pacific. The Chinese Civil War, which resumed in the immediate wake of Japan's surrender, unfolded alongside early signs of American-Soviet geopolitical irreconcilability regarding Europe and the Middle East. In contrast to the aftermath of World War I, the United States launched into post-World War II occupation of enemy territories equipped with fairly well crafted blueprints. In the case of Japan, committees of experts set up within the State and War Departments began discussing postwar plans within six months of the Pearl Harbor attack. The San Francisco Peace Treaty and the 1951 US-Japan Security Treaty catalyzed an ideological debate inside Japan and shaped party alignments for most of the Cold War. The Korean War also reshaped Japan's postwar trajectory by igniting its economy. The Korean War was a seminal event of the early Cold War, both regionally and globally, and of Korean history. Despite a major uprising in 1919 and sporadic guerrilla activity in extreme northern Korea after that, Koreans proved unable to undermine Japanese rule. The Americans and the Soviets bypassed the Koreans in deciding to occupy their country and in choosing a boundary between their occupation forces, but they could not ignore them once on the peninsula. While Koreans celebrated Japan's demise and interpreted "in due course" as meaning early independence, they were far from united on the future of their country. The Korean War may be divided into four stages. Koreans killed, wounded, or missing numbered approximately 3 million, a tenth of the population. In the end, the Korean War was a clear-cut victory for no one, but it helped to stabilize the conflict between the Soviet Union and the United States at a level below direct combat. US grand strategy during the presidencies of Dwight D. Eisenhower and John F. Kennedy derived, in the broadest sense, from the same, deep-seated fear: that the Soviet Union's combination of implacable hostility, mounting military strength, and positive ideological appeal posed a fundamental, even existential threat to US national security. Eisenhower's national security strategy attached greater value to the role of allies than had Truman's. The Eisenhower administration also accorded much greater weight to the place of psychological warfare, public diplomacy, and propaganda within overall Cold War strategy. Despite the shortcomings and contradictions emphasized above, Eisenhower's grand strategy displayed some marked strengths and was predicated on a number of keen insights. During the presidential campaign and throughout his foreshortened presidency, Kennedy articulated a strategic vision that differed from Eisenhower's in key respects. By the end of the Kennedy administration, mutual deterrence or mutually assured destruction, a more graphic term for the concept, had virtually acquired the status of official doctrine. The Soviet foreign policy was unique in the extent to which their Marxist-Leninist beliefs determined their perception of why other states behaved the way they did. The conduct of foreign policy under Molotov was Stalin's without Stalin. Molotov's policies followed from the doctrinaire assumption that inherent contradictions among capitalist states would make it possible for the Soviet Union to drive a wedge between Washington and its allies, split the North Atlantic Treaty Organization, and expel the United States from Europe. The novelty of Khrushchev's thinking derived from his belief that the Soviet Union could afford to reduce its reliance on military power and benefit from a demilitarization of the Cold War. Among the top Soviet leaders, Khrushchev was the last true believer in the ideals of Communism. There was a deeper tragedy in the trajectory of Soviet foreign policy from Stalin's death to the Cuban drama. The framework for ensuing developments in Eastern Europe was established at the end of World War II. Modification of the Soviet model reflected specific local historical and economic factors as well as the geopolitical location of the East Central European region. With the implementation of the Soviet model in Eastern Europe, the Communist system was built up within a few years, but an extremely rapid pace of investment in heavy industry, especially in armaments and agricultural collectivization campaigns, soon exhausted the economies of these countries. The permissible pace and scope of post-Stalin political reform in East Central Europe depended greatly upon which faction happened to have the upper hand in the incessant power struggles within the Soviet leadership, but there was never any question in Moscow that the satellite states should remain inside the Soviet empire. Immediately after the Poznan uprising, events moved swiftly in Poland. Social ferment grew, and people began calling openly for reform and change. This chapter reconstructs how Beijing and Moscow tried to maintain the alliance, and how the corrosive Sino-Soviet partnership affected the course of the Cold War in Asia. The Korean War was the first serious test of the Sino-Soviet alliance. Soviet military aid supporting China's intervention in Korea was evidence of Moscow's will to keep its promise. Khrushchev's Kremlin did not disappoint Beijing in the immediate post- Korean War years. With the Sino-Soviet agreement on technology transfer signed in October 1954, Beijing obtained similar commitments from East European countries. At the end of the 1950s and the start of the 1960s, the growing internal difficulties embedded in the Sino-Soviet alliance evolved into open estrangement. The Sino-Soviet rift dramatically changed the Cold War in Asia. Both Moscow and Beijing should have benefited from a Cold War alliance. China and the Soviet Union failed to overcome the perceptions and misperceptions derived from their culturally bound ethnocentrism. Nuclear weapons are so central to the history of the Cold War that it can be difficult to disentangle the two. During World War II, three countries decided to build the atomic bomb: Britain, the United States, and the Soviet Union. Relations between the Soviet Union and the Western powers grew steadily worse in the five years after World War II. The hydrogen bomb, which uses a fission bomb to ignite thermonuclear fuel, marked a new and extremely important stage in the nuclear-arms race. Nuclear deterrence was now the organizing principle of US national security policy. Soviet policy after Stalin's death in March 1953 ran parallel to American policy in some key respects. The origins of the nuclear-arms race can be traced to the political rivalry between the wartime allies, the Soviet Union, the United States, and Britain. The Cuban missile crisis was a turning point in the Cold War. In Europe, the Cold War shaped a new way of transferring and selling ideas, values, productions, and reproductions. The Cold War played itself out against a background of tremendous cultural change. The development began right after World War II, underwent a serious transformation in the 1960s, and ended with the fall of the Berlin Wall. The bipolar conflict had a profound qualitative effect on the development of European culture and society. As in the Soviet Union, the media played a decisive role in the propaganda scheme. The US radio station in Berlin and Radio Free Europe were among the most important channels for Western propaganda. From the beginning, Europeans encountered the influx of American culture with both admiration and resistance. As a result of the bipolar competition for ideological and cultural preponderance, the Cold War privileged culture and cultural relations in Europe to an unprecedented degree. This chapter explores how the foreign and the domestic engaged one another from the end of World War II to the early 1960s. Many historical surveys of the domestic Cold War begin with the dramatic story of Senator Joseph McCarthy's rise to power. McCarthyism drew heavily on the dualistic language and binary frameworks deployed by foreign policymakers, but the synergy between McCarthyism and the Cold War did not mean they were one and the same. The political background noise for Marshall's speech was the brewing Cold War, as President Harry S. Truman's loyalty program and his landmark Truman Doctrine were pushed forward that same year. The participation of nonstate actors in nuclear preparedness debates brings a final but important feature of the early Cold War's political and cultural landscape: nuclear fear. The Cold War's cultural authority was constantly tested by the more resilient and long-evolving features of American political culture. 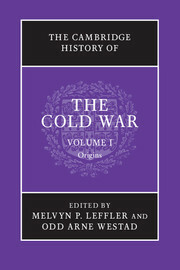 This chapter argues that the Cold War was of supreme importance to all aspects of Soviet politics, and that the literature on the period, which is still in an early stage of development following the opening of archives, certainly could pay greater attention to the interaction between domestic and international forces. The Cold War placed the USSR in an equally difficult position in the ideological sphere. The Stalinist economic system was designed to reduce consumption and extract resources from agriculture, 'pumping' them into heavy industries and defence, and the absence of material incentives ensured that the regime had to rely on high levels of coercion. Stalin's political position, like that of most Bolshevik leaders, changed over time, but it is possible to identify a reasonably consistent belief in the primacy of politika. The Cold War did not create a fundamentally different form of politics because the Soviet system was already designed for the mobilisation of its population for war. The Cold War tends to obscure the significance of transnational postcolonial visions in the global South that imagined a world apart both from the biopolar international system and from the imperial order. The high imperialism of the nineteenth century encountered almost immediate resistance from many colonized peoples. The experiences of World War II dramatically shifted the fortunes of many anticolonial movements in the imperial world. The rise of Mao's China in 1949 and the outbreak of the Korean War in 1950 brought the dynamics of the Cold War more fully into the processes of decolonization and increasingly influenced superpower politics toward the global South. In April 1955, leaders from thirty newly postcolonial states, along with observers from national liberation movements throughout the colonial world, gathered in Bandung, Indonesia. Bandung, the Suez crisis, and Nasser's revolutionary nationalism further complicated and deepened the relationship between the Cold War and decolonization. Control of strategic raw materials played a key role in the origins and outcome of World War II and continued to be a source of power and policy during the Cold War. Access to uranium, the main ingredient in the atomic bomb, was an important strategic issue during the first decade of the Cold War. Oil was central to military power and economic life, and control of oil was a key source of power and influence throughout the Cold War. During World War II, the United States and Britain set up an organization, the Combined Development Trust, to gain control of the world's supply of high-grade uranium. The uranium that fueled the bomb that destroyed Hiroshima came from Belgian Congo, and Congo remained the main source of uranium for the United States until the early 1950s. In the late 1940s, seven large oil companies controlled over 90 percent of oil reserves outside North America and the Communist countries. This bibliographical essay presents a list of titles that help the reader to understand the origins, causes and early years of the Cold War. The entries are written by the authors of the chapters in the main text, with additions, deletions, and cross-references suggested by the editors. Titles listed in the essay include: publications on researches in the Cold War in its various settings; and works that general surveys political economy in the West throughout the era of the Cold War. Memoirs, diaries, and printed letters vividly illustrate the thinking of US policymakers during the Truman era. Titles listed also include: writings on Soviet strategy and diplomacy in Asia and the Near East as well as Cold War crises in 1945-53; books that overview of Britain's position in the world at the end of the war; and exhaustive literature on the American contribution to the division of Germany.